The Name Inspector has had a hard time writing this post. The reason is a sad one: his father died in January. It isn’t so much that grieving has made it impossible to work. Rather, The Name Inspector has had the impulse to announce this news and to offer some kind of tribute, yet has been hesitant to step out of the safe third-person space he’s created for himself on this blog. But here we go. For this post The Name Inspector is going to be me, and I’m going to tell you a little about my dad Ronald Johnson, who has influenced me more than I sometimes recognize. Dad was a commercial artist. He worked for a while at the Minneapolis branch of Brown & Bigelow, and for many years at a design studio called Cy DeCosse & Associates, where he specialized in food package design. When I decided I wanted to go to a private college, he went freelance. It was a scary move for him, but it boosted his income considerably, and he was able to finance my college education, for which I’ll always be grateful. Dad’s biggest client was General Mills. He designed cereal boxes for them, including the original box for Honey Nut Cheerios, now the top-selling cereal in the U.S. (according to 2011 Nielsen data). That led to my first professional writing gig: creating a how-to manual for drawing the Honey Nut Cheerios bee mascot. My dad also designed boxes for Cinnamon Toast Crunch and the now defunct Circus Fun cereal. The black background on the Circus Fun box was unusual at the time (and VERY 1980s), and earned my dad a special award from General Mills. I was delighted to see the covers of Circus Fun and Cinnamon Toast Crunch featured in The Great American Cereal Book. Dad joined the Army Air Corps toward the end of WWII. He trained for the dangerous job of tailgunner, but thankfully never went into combat. While stationed in Texas, he saw a strange flash in the Western sky and his crew was instructed not to fly in that direction. That was almost certainly his brush with the Trinity test of the first atomic bomb near Alamogordo, New Mexico. Despite his old-school proclivities, dad had a youthful quality that he maintained through his contact with the younger, weirder creative types he worked with. 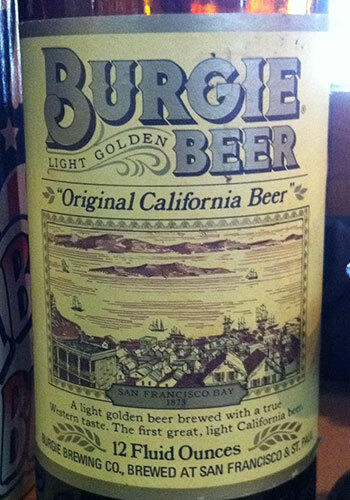 He was a fan of the drawing style of Robert Crumb, and even did a few Crumbesque cartoons of his own, including some stickers for Burgie Beer (for which he also designed the label pictured here). Ron Johnson was an affectionate and charming man with a talent who did his job well and supported a big family. And he was my dad. I’ll miss him. My dad with my son Tobias.